^ 1.0 1.1 Murray 1992, p. 5. ^ Murray 1992, pp. 7-9. ^ Barber 2012, pp. 55, 62. ^ Murray 1992, p. 6. ^ 5.0 5.1 Asbridge 2004, pp. 308-309. ^ Runciman 1989a, p. 147. ^ Lock 2006, pp. 20-21. ^ Asbridge 2004, p. 110. ^ Runciman 1989a, p. 150. ^ Asbridge 2004, pp. 111, 117. ^ Asbridge 2004, pp. 142-143. ^ Runciman 1989a, p. 198. ^ Murray 2000, p. 61. ^ Barber 2012, p. 17. ^ Lock 2006, pp. 22-23. ^ Runciman 1989a, p. 276. ^ Runciman 1989a, pp. 277-278. ^ Lock 2006, p. 25. ^ Runciman 1989a, pp. 298-299. ^ Asbridge 2004, p. 332. ^ Fink 1969, pp. 380, 382. ^ Runciman 1989a, p. 322. ^ MacEvitt 2010, p. 75. ^ Barber 2012, p. 62. ^ Murray 2000, p. 94. ^ 26.0 26.1 26.2 Tyerman 2006, p. 186. ^ Fink 1969, p. 381. ^ Runciman 1989b, p. 36. ^ 29.0 29.1 MacEvitt 2010, p. 78. ^ 30.0 30.1 30.2 30.3 30.4 Runciman 1989b, p. 37. ^ Lock 2006, p. 26. ^ 32.0 32.1 32.2 Runciman 1989b, p. 38. ^ Runciman 1989b, pp. 76, 80. ^ Runciman 1989b, p. 80. ^ Fink 1969, p. 383. ^ Runciman 1989b, pp. 80-81. ^ Fink 1969, p. 388. ^ Fink 1969, pp. 392-393. ^ Lock 2006, p. 27. ^ Runciman 1989b, p. 41. ^ 41.0 41.1 41.2 41.3 41.4 Barber 2012, p. 82. ^ Runciman 1989b, pp. 41-42. ^ 43.0 43.1 43.2 Fink 1969, p. 389. ^ Runciman 1989b, p. 42. ^ 45.0 45.1 45.2 45.3 Köhler 2013, p. 65. ^ Runciman 1989b, p. 43. ^ Runciman 1989b, pp. 43, 44. ^ Fink 1969, p. 390. ^ 49.0 49.1 49.2 49.3 Runciman 1989b, p. 45. ^ 50.0 50.1 Runciman 1989b, p. 111. ^ 51.0 51.1 51.2 51.3 Maalouf 1984, p. 70. ^ Barber 2012, p. 84. ^ Lock 2006, p. 28. ^ 54.0 54.1 54.2 Fink 1969, p. 393. ^ Runciman 1989b, pp. 110-111. ^ Runciman 1989b, pp. 111-112. ^ 58.0 58.1 58.2 58.3 58.4 Runciman 1989b, p. 112. ^ Köhler 2013, p. 124. ^ Köhler 2013, p. 66. ^ 61.0 61.1 Lock 2006, p. 29. ^ 62.0 62.1 Maalouf 1984, p. 69. ^ Runciman 1989b, pp. 112-113. ^ 64.0 64.1 64.2 64.3 64.4 64.5 64.6 Lock 2006, p. 30. ^ 65.0 65.1 Fink 1969, p. 394. ^ 66.0 66.1 66.2 66.3 66.4 Runciman 1989b, p. 113. ^ Köhler 2013, p. 70. ^ 68.0 68.1 68.2 68.3 Runciman 1989b, p. 114. ^ Maalouf 1984, pp. 70-71. ^ Fink 1969, p. 397. ^ 71.0 71.1 71.2 Runciman 1989b, p. 115. ^ Fink 1969, p. 398. ^ 73.0 73.1 73.2 Barber 2012, p. 99. ^ MacEvitt 2010, p. 91. ^ Barber 2012, pp. 99-100. ^ 76.0 76.1 Barber 2012, p. 100. ^ 77.0 77.1 77.2 Runciman 1989b, p. 116. ^ Runciman 1989b, pp. 116-117. ^ 79.0 79.1 Fink 1969, p. 399. ^ Runciman 1989b, p. 117. ^ MacEvitt 2010, p. 92. ^ Runciman 1989b, pp. 117-118. ^ Runciman 1989b, p. 118. ^ Barber 2012, p. 101. ^ 85.0 85.1 85.2 85.3 85.4 Fink 1969, p. 400. ^ Runciman 1989b, pp. 121-122. ^ 87.0 87.1 Runciman 1989b, p. 122. ^ Lock 2006, p. 31. ^ Runciman 1989b, p. 123. ^ 90.0 90.1 90.2 Runciman 1989b, p. 124. ^ Fink 1969, pp. 400-401. ^ 92.0 92.1 Lock 2006, p. 32. ^ 93.0 93.1 93.2 Fink 1969, p. 402. ^ Runciman 1989b, pp. 125-126. ^ 95.0 95.1 95.2 95.3 95.4 95.5 Runciman 1989b, p. 129. ^ Fink 1969, p. 403-404. ^ 97.0 97.1 Fink 1969, p. 404. ^ Barber 2012, p. 104. ^ 99.0 99.1 99.2 99.3 99.4 Fink 1969, p. 405. ^ Runciman 1989b, pp. 129-130. ^ Murray 1992, p. 1. ^ 102.0 102.1 102.2 Barber 2012, p. 117. ^ 103.0 103.1 103.2 103.3 Murray 1994, p. 61. ^ Barber 2012, pp. 117-118. ^ 105.0 105.1 105.2 105.3 105.4 Barber 2012, p. 118. ^ Barber 2012, pp. 118-119. ^ Barber 2012, p. 119-120. ^ 108.0 108.1 108.2 Mayer 1985, p. 139. ^ 109.0 109.1 109.2 109.3 109.4 Runciman 1989b, p. 146. ^ 110.0 110.1 Murray 1992, p. 128. ^ 111.0 111.1 111.2 111.3 111.4 111.5 Lock 2006, p. 34. ^ 112.0 112.1 Runciman 1989b, p. 148. ^ Barber 2012, p. 122. ^ Runciman 1989b, p. 147. ^ Barber 2012, p. 123. ^ Runciman 1989b, p. 149. ^ Barber 2012, pp. 123, 360. ^ Barber 2012, pp. 123-124. ^ 120.0 120.1 Runciman 1989b, p. 152. ^ Barber 2012, p. 124-125. ^ 123.0 123.1 Barber 2012, p. 129. ^ 124.0 124.1 Runciman 1989b, p. 153. ^ 125.0 125.1 125.2 Barber 2012, p. 125. ^ Barber 2012, pp. 119, 129. ^ 127.0 127.1 127.2 Barber 2012, p. 131. ^ 128.0 128.1 Tyerman 2006, p. 206. ^ Read 2001, p. 91. ^ 130.0 130.1 Barber 2012, p. 134. ^ 131.0 131.1 Tyerman 2006, p. 254. ^ Barber 2012, p. 135. ^ 133.0 133.1 Barber 2012, p. 139. ^ 134.0 134.1 134.2 134.3 134.4 Lock 2006, p. 35. ^ Runciman 1989b, p. 158. ^ 136.0 136.1 136.2 Murray 1994, p. 67. ^ 137.0 137.1 Barber 2012, p. 137. ^ 138.0 138.1 138.2 138.3 Runciman 1989b, p. 159. ^ Runciman 1989b, p. 160. ^ 140.0 140.1 140.2 140.3 Runciman 1989b, p. 162. ^ 141.0 141.1 Lock 2006, p. 36. Read, Piers. The Templars. New York: Da Capo Press. 2001. ISBN 0-306-81071-9. Maalouf, Amin. The Crusades Through Arab Eyes. SAQI. 1984. ISBN 978-0-86356-023-1. Barber, Malcolm. The Crusader States. Yale University Press. 2012. ISBN 978-0-300-11312-9. Lock, Peter. The Routledge Companion to the Crusades. Routledge. 2006. ISBN 9-78-0-415-39312-6. William of Tyre, A History of Deeds Done Beyond the Sea, trans. E. A. Babcock and A. C. Krey. Columbia University Press, 1943. Tibble, Steven. Monarchy and Lordships in the Latin Kingdom of Jerusalem, 1099-1291. Clarendon Press. 1989. ISBN 978-0-19-822731-1. Tyerman, Christopher. God's War: A New History of the Crusades. The Belknap Press of Harvard University Press. 2006. ISBN 978-0-674-02387-1. Murray, Alan V. The Crusader Kingdom of Jerusalem: A Dynastic History, 1099–1125. Prosopographica et Geneologica. 2000. ISBN 978-1-9009-3403-9. MacEvitt, Christopher. The Crusades and the Christian World of the East: Rough Tolerance. University of Pennsylvania Press. 2010. ISBN 978-0-8122-4050-4. Mayer, Hans Eberhard. The Succession to Baldwin II of Jerusalem: English Impact on the East. Dumbarton Oaks Papers. 1985, 38: 139–147. ISSN 0070-7546. Asbridge, Thomas. The First Crusade: A New History: The Roots of Conflict between Christianity and Islam. Oxford University Press. 2004. ISBN 978-0-19-517823-4. Runciman, Steven. A History of the Crusades, Volume II: The Kingdom of Jerusalem and the Frankish East, 1100-1187. Cambridge University Press. 1989b. ISBN 0-521-06162-8. Murray, Alan V. Baldwin II and his Nobles: Baronial Factionalism and Dissent in the Kingdom of Jerusalem, 1118-1134. Nottingham Medieval studies. 1994, 38: 60–85. ISSN 0078-2122. Runciman, Steven. A History of the Crusades, Volume I: The First Crusade and the Foundations of the Kingdom of Jerusalem. Cambridge University Press. 1989a. ISBN 0-521-06161-X. Köhler, Michael. Alliances and Treaties between Frankish and Muslim Rulers in the Middle East: Cross-Cultural Diplomacy in the Period of the Crusades. BRILL. 2013. ISBN 978-90-04-24857-1. Murray, Alan V. Dynastic continuity or dynastic change? 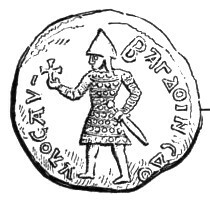 Accession of Baldwin II and the nobility of the Kingdom of Jerusalem. Medieval Prosopography. 1992, 13: 1–27. ISSN 0198-9405. Sergio Ferdinandi, La Contea franca di Edessa. Fondazione e profilo storico del primo principato crociato nel Levante (1098-1150), Pontificia Università Antonianum, Roma 2017, 934 p. (ISBN 978-88-7257-103-3). Fink, Harold S. The Foundation of the Latin States, 1099–1118. (编) Setton, Kenneth M.; Baldwin, Marshall W. A History of the Crusades, Volume One: The First Hundred Years. The University of Wisconsin Press. 1969: 368–409. ISBN 1-58684-251-X.